I feel September can bring sadness to a meadow gardener. The field has been cut, the apples in the orchard have fallen, the orchestra of crickets and beetles has left and I no longer see the Tawny owl that used to greet me in the early mornings of July. The orchard now has a degree of formality about it and it’s hard to imagine that this was once awash with grasses the colour of brown sugar and intermingled with purples, yellows and whites from the wild flowers. Meadow grass in the Orchard. Birds Meadow Vetchling and Red Clover. This, however, isn’t a time to feel sorry for ourselves; it’s a time of reflection, to feel proud about what we have achieved, even if it was only giving a native creature a grassy home for the summer or showing someone the delights of our wildflowers. Already I ponder as to how to increase the meadows seasonality next year; perhaps allowing some areas to remain long and certainly collecting and sowing wild seed of Succisa pratensis into the orchard to increase the colour pallet in late summer (Succisa being a late flowering plant of September). We should also keep areas long to allow the community of wildlife that has gathered over the summer an area to escape into when we begin the end of season mow. The problem this year was the fact that we had to cut our meadow early. This is because we achieved something truly amazing this year, managing to secure green hay from a neighbouring ancient meadow called Marden which is managed and cared for by Kent Wildlife Trust. Green hay is used in the process of bringing one meadows native flora to another possibly less floral meadow. In essence, it’s just a transfer of seed but the way in which it’s achieved is quite interesting. 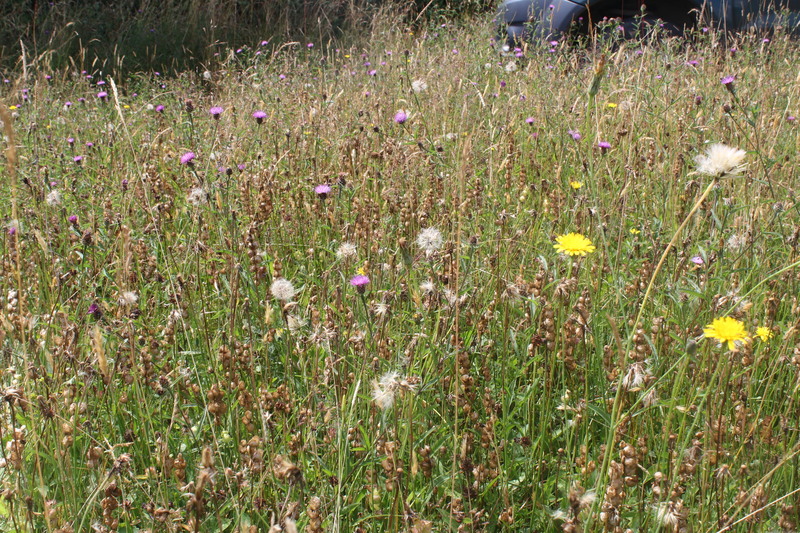 Because Marden is under stewardship they must cut the meadows in accordance with the guidelines. July the 15th was the date given to us so we worked long and hard to prepare our orchard. We cut the orchard predominantly with scythes and I spent some of the summer teaching people this craft so we could have an even bigger work force. We also managed to erect a traditional hay stack with skills I learnt in Slovenia. All this began to create the more rural atmosphere that Vita used to love. In fact, the creation of the hay stack was fantastic. We built it on our meadow study day in which people came to learn and understand about meadows. 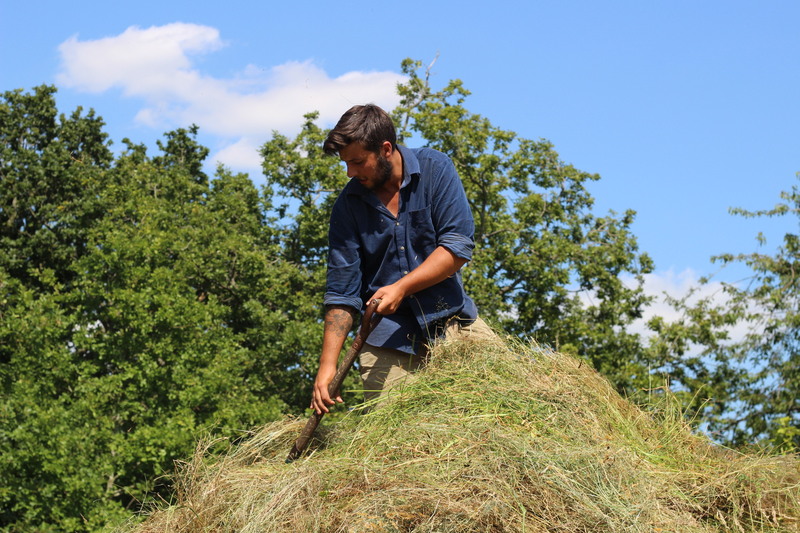 We had food, a drink in the orchard on a beautiful scorching day and the afternoon was filled with laughter and enjoyment as we built the haystack higher and higher. However, the greatest sight that the haystack bestowed upon me was the sight of the tawny owl each morning at 5am when I arrived to begin the new day’s scythe. He would be there twisting and turning his head, I suspect waiting for his early morning prey before he began his days slumber. In fact, the hay stack became a haven to all the meadow creatures as the grasses diminished. But back to the green hay. Once cut, we began to scarify the 70 year old thatch that had formed and went at it with a real zeal and malice leaving no stone unturned. Removing the thatch will in turn create bare soil areas for seeds to fall into and grow without any interruptions. We used a harrow that could be pulled by our Kubota tractor and had to resort to two bits of York stone, one concrete slab and heavy duty metal chains to give it enough weight to penetrate the dense and concrete like thatch. The harrow with all its chains and weights created a sound that echoed around the garden and reminded me of Jacob Marley from “A Christmas Carol”. Once the orchard had been scarified and all the thatch removed (to stop nutrient transfer) we were able to collect the hay. The issue with green hay is that it must be cut, collected and distributed within 24 hours. If not, the hay will begin to compost, heating up and thus lowering the integrity of the seed. So Pete, Bridget and I went with our trailer to Marden to collect the hay. Upon arrival we met Matt, the ranger who manages Marden and who has been a tremendous help to us over the year. Matt lowered off his motorised scythe and started to cut lanes for us to rake into rows and load onto the trailer. Pete and Josh raking the hay. 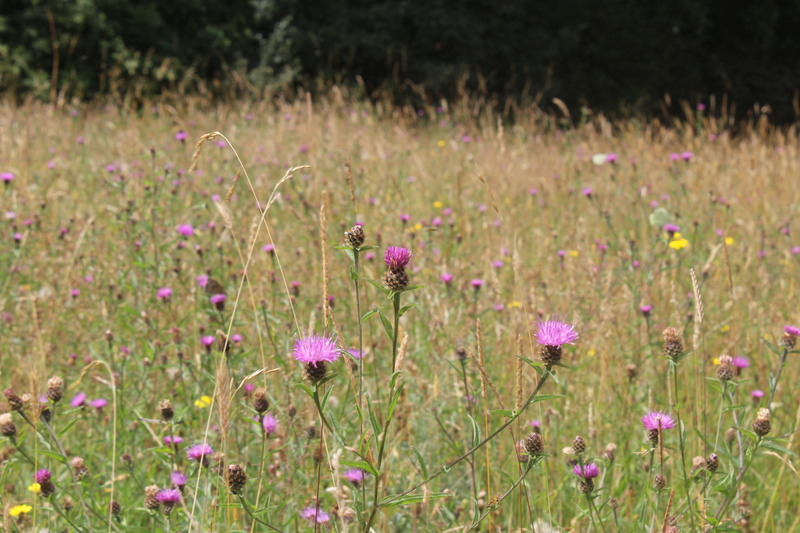 The meadow of Marden itself looked beautiful; the knapweed was creating a purple mass within the field’s top canopy, the white snow-like umbels of yarrow and the butter yellow of Dyers Greenweed complimented each other perfectly. The sound of the yellow rattle in the wind gave the meadow a voice and it seemed a sacrilege to cut it at this point, but the rattle seed was beginning to fall and this was a key plant that we needed. Marden Meadow showing Yellow Rattle seed. Once collected we roped it down with hessian sheets to stop any valuable seeds being lost, and left Matt to carry on cutting whilst we rushed back to Sissinghurst. Once back we removed the sheets and began to carry the hay into the orchard which we evenly distributed over the newly mown and harrowed field. We worked on the principle that 1 acre of cut hay will cover 3 acres in the next field. Knowing that Matt had given us an acre’s worth of hay and knowing the orchard is around 3 acres in size, we just had to evenly spread it over the entire area until the hay ran out. If it isn’t evenly spread and layers form, the hay can begin to heat up and compost again. When the hay had gone the seeds left in the trailer was a treasure trove. Grabbing a dustpan and brush I slowly and carefully swept the seed into the pan and sowed straight into the meadow, a ‘waste not, want not’ principle. The hay ready to be transported to Sissinghurst. Arriving at Sissinghurst and hoping the seed doesn’t blow away. With the hard logistics over we could begin to relax after 6 weeks of hard graft, all that had to be done now was to leave the hay for three weeks, flicking it every three days. Flicking the hay encourages the seeds to leave the pods as the seeds ripen and allows suitable airflow to once again stop the hay from composting. During this period I felt like a schoolboy in a sweet shop, able to pick out certain plants from the hay, most excitingly Greenwinged orchids which Marden is famous for. Fingers crossed! Thankfully we had a dry July and the seeds soon ripened and began to leave home, but I will say this about flicking and weather; never have I been more frustrated than when I had to flick the hay in the high winds we had all month. The hay would go left or right, up or just collect in a huge bird’s nest mass that had to be slowly picked to pieces. So when the day came for the hay to be removed I could not have been more relieved. More raking and removal of hay ensured that composting didn’t occur. However, if it had been possible to have grazing animals in the orchard, I think I would have just let the animals eat the litter and then proceed to keep the meadow grass down until winter. In fact, animals also help tread all the newly fallen seed in and create ruts for further seed to fall into, but I think I’ll let our thousands of visitors who now walk upon the mown grass do this job. So as you can see, it’s a very exciting time for the meadow. The benefit of hay strewing from a local ancient meadow is that we now have a seed source with Kentish provenance. We have put Kent seeds back into a Kent field which is fantastic, particularly as Vita was very fond of Kent and the local countryside. Our fauna will get also get huge benefits from this as they are already naturally adapted to Kentish plants. So let us, the meadow gardeners not feel glum about the end of a season and think of next year and the fruits of our labour. Please come back next year and visit our orchard to see if this hay has had any major benefits and also to view many of our new grassland areas.